You’ll dine in the evening at The Farmhouse Restaurant, which offers a fine dining experience in a relaxed yet formal country setting. The seasonal menu features local organic and free-range ingredients, together with an international flair. Your three course dinner for two includes a choice of small plate, soup OR salad, choice of entrée, and choice of dessert and non-alcoholic beverage. 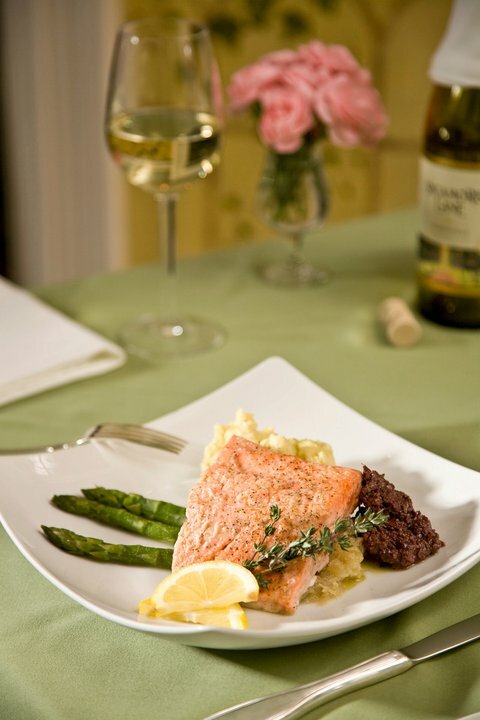 If you wish, for an additional cost, choose a wine from our Wine Spectator Award-winning list, or a craft beer from the Turkey Hill Brewing Company to accompany your meal. Just a few of the small plates/starters on the current menu include a crab cake served over cabbage slaw with spicy remoulade, in-house hickory smoked Alaskan salmon with horseradish-dill cream, or a terrine of roasted and candied red beets with goat cheese, dried cranberries, and walnuts. Alternate choices to begin your meal include the soup of the day or a salad. Our House Salad of greens is topped with feta, mandarin orange, grape tomato, cucumber, and apple cider vinaigrette. Other choices include a Kale Salad with sliced strawberries, toasted pecans, goat cheese, and a strawberry vinaigrette, a Wedge Salad, or Caesar Salad. The dozen different entrees on the menu include seafood, lamb, duck, chicken, beef, and vegetarian options. The winter menu includes Apricot Lamb Osso Buco braised with root vegetables and dried apricots in an Apricot Brandy Brown Sauce and Roast Duck Cumberland with Currant-Apple Dipping Sauce. Grilled Herb Chicken is marinated in a citrus-dijon-herb marinade and topped with jumbo shrimp and lump crab meat. For seafood lovers, Seafood Edgewood combines jumbo shrimp, sea scallops, crab, wild mushrooms, and spinach in a garlic-vermouth sauce with linguini. The Chef’s special Limoncello Sea Bass is sautéed with artichokes and tomato, then finished with Limoncello Cream Sauce. Please visit our website for the complete menu offerings. After dinner, retreat to your Stable Room with its many amenities. In the morning, let us pamper you with our leisurely gourmet breakfast, served until 10:00 am on weekdays and 11:00 am on Saturdays and Sundays. Begin with freshly-squeezed orange juice and our homemade pastries, plus your choice of cereals, fresh fruit, and yogurt. Then let us tempt you with the chef’s special hot breakfast entrée of the day. Perhaps he will make a savory frittata with seasonal vegetables, accompanied by our Cheesy Grits, or prepare a sweet treat like chocolate chip pancakes for you to drizzle with local maple syrup. Don’t miss the chance for a romantic winter escape this winter! There are lots of things to do in the Bloomsburg area, from outdoor activities to visiting wineries to antiquing. Just call us at (570) 387-1500 to reserve your stay or book directly on our website if you prefer. * Please note this Getaway Special Package may not be available all dates January – April 2019. 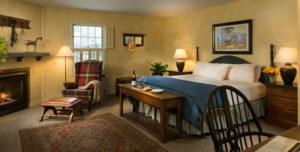 Reservations must be made directly for your room at the Inn and dinner at the Farmhouse Restaurant in advance. The package price does not include 6% state and 3% local hotel taxes, gratuities, and alcoholic beverages. 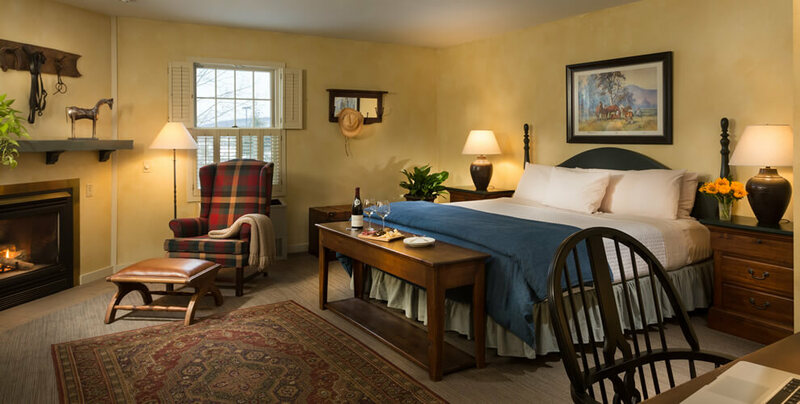 This entry was posted in Bloomsburg hotel, Food & Drink, Uncategorized and tagged Bloomsburg restaurants, farm-to-table dining, romantic B&B package, Romantic getaway, Romantic inn getaway, Romantic special by admin. Bookmark the permalink.